How many times does someone ask you these questions each day? Unless you have a sign posted at your window that says “cash only” (and people actually read it), the answer is probably a lot. According to a 2012 report by Javelin Strategy & Research, customers use cash to complete only 27 percent of point of sale (POS) transactions. By 2017, researchers predict that the number will have dropped to 23 percent, as more and more people use credit cards, debit cards, and other electronic payment methods for their everyday purchases. As a food truck owner serving busy people who are looking for the right mix of quality and convenience, that’s a trend you can’t afford to ignore. Just a few years ago, it was easier for food truck owners to accept cash than credit cards. If you were able to accept credit cards, you likely had to invest in an expensive POS system or use one of those obnoxious carbon copy machines that never quite pressed the right way. But today, new technology gives food truck owners more options than ever before. Mobile payment processors give your truck freedom—allowing you to attract customers who would walk on by if you only accepted cash, while also making it easier for you to manage credit and debit transactions. Of course, payment processors aren’t all knights in shining armor. They’re still businesses in their own rights that strive for profit, which means that you need to understand your options. Earlier this month, mobile payment processor Square announced that they will change their flat rate payment plans to a “per-swipe” pricing model effective February 1, 2014. What does that mean for your food truck? Well, if your truck makes between $10,000 and $21,000 in sales each month, that means your payment processing fees will most likely be going up. In 2012, Square began charging a flat, monthly rate of $275 for businesses that made less than $250,000 per year—and they made a lot of fans that way. Now, they’re returning to the industry-standard rates they started at: a 2.75% charge for every transaction. Some small business owners aren’t losing any sleep over this change. They love Square and they’re happy to remain loyal. But others are disappointed by the apparent bait-and-switch—and they’re looking to evaluate their options. Whether you’re researching mobile payment processors for the first time or thinking about switching to a new provider, keep this one simple truth in mind: for your customers, cash is no longer king. And it’s up to you to find a solution that satisfies their needs. With that in mind, we’ve compiled a brief guide to the top three payment processors you should know about. These providers—Square, Intuit GoPayment, and PayPal Here—offer unique benefits to food truck owners who want affordable, convenient transactions on the go. If it’s been awhile since you looked into the best ways to accept credit cards, understand that things have changed dramatically in the last three years alone. Today’s mobile payment processors make it super simple to get started. When you sign up for any of these three providers, you’ll receive a free card reader that plugs into the audio jack of your Android or iOS smart phone or tablet. Then, you’ll download the corresponding app and connect it to your bank account to get started. 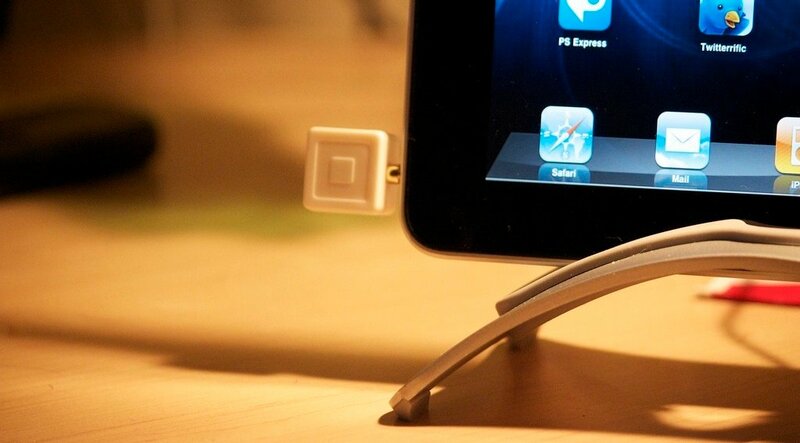 Let’s begin by looking at Square—the mobile payment processing giant that’s taken the business world by storm. In 2012, Square—a company founded by Twitter co-founder Jack Dorsey—had more than three million users, processed $10 billion annually, and formed partnerships with major companies Starbucks and Burberry. It’s not a stretch to say that Square is the most popular brand from the mobile payment processor pack. Pricing and Fees: According to Square’s new policies, you’ll pay 2.75% of the total transaction cost each time someone swipes his or her card through your Square reader. If you have to manually enter a transaction, you’ll pay a slightly higher rate of 3.5% plus an additional 15-cent charge. Getting Paid: Funds are deposited directly into your bank account. Any payments made before 5pm PST will be available the next business day, while all payments made after 5pm PST are available on the second business day. Perks: Businesses that earn less than $10,000 per month will save money under the new pricing plan, and there are no caps as to how much you can earn or accept through Square. Customers can also pay through their smart phones using Square Wallet, a service that promises “a more personal transaction for you and your customer.” Tech-savvy customers who are up on the latest trends will appreciate this convenient option—and as a result, they’ll be more inclined to continue patronizing your business. GoPayment comes from Intuit, the mega software company behind programs like TurboTax and QuickBooks. While GoPayment was clearly inspired by Square, this powerful payment processor packs an extra punch by coming from a reliable, trusted brand. Pricing and Fees: GoPayment offers two convenient pricing plans for small business owners. Most users opt for the “Pay Monthly & Save” plan. For $12.95 per month, users enjoy reduced payment processing fees of 1.75% per swiped transaction and 2.75% on keyed transactions. Users who prefer to “Pay As You Go” have no monthly fees, but they do pay a higher rate of 2.75% per swiped transaction and 3.75% on keyed transactions. Additionally, users should be aware that some credit cards and rewards cards fall under Intuit’s broad definition of a “non-qualified transaction” and are subject to an additional 15-cent charge. Getting Paid: All credit card payments are processed and delivered to your account right away, and you can send receipts to your customers through email or text. Instant payment is definitely one of the greatest features behind GoPayment. Perks: GoPayment makes it easy to customize and brand your credit card receipts, add additional employees to your payment acceptance account, and for customers to sign their names using touch-features on your device. It’s an elegant, all-in-one solution to accepting mobile payments from anywhere. With a long history in the electronic payment industry, PayPal has an established record of innovation, success, and service. Like Square and GoPayment, the PayPal Here system is a mobile credit card reader that allows food truck owners and other small businesses to accept payments and receive speedy access to funds on the go. Most importantly, it gives customers the opportunity to visit your truck at lunchtime even when they spent their last few dollar bills in the vending machine for a mid-morning pick-me-up at work. Pricing and Fees: PayPal Here’s pricing structure is similar to those behind GoPayment and Square. When you swipe a customer’s card through the PayPal Here reader, you’ll pay a flat 2.7% transaction fee. Manual transactions are 3.5% of the total purchase amount plus an additional 15 cents. On the surface, these prices are most similar to Square’s new payment plan. However, PayPal often advertises that the one percent cash back bonus available with their debit card effectively makes the rates 1.7% and 2.5%, which aligns closely with GoPayment’s pricing structure. You May Also Like... What Do You Want Your Legacy To Be, Food Truck Owners? Getting Paid: When a customer pays for lunch at your truck, the funds go straight into your PayPal account within minutes. That means no more waiting for funds to process overnight or worrying about transactions clearing over the weekend. If you use the free PayPal debit card, you can withdraw money right away—and you’ll also earn one percent cash back on all purchases you make with the card. Just be careful not to spend all those cash back rewards in one place! Perks: In addition to making debit card and credit card payments simple, PayPal Here also allows you to accept checks and take payments from customers’ PayPal accounts. Because the money syncs up with your own PayPal account, you can easily transfer it between other bank accounts or use the money to pay for goods and services wherever PayPal is accepted. Even if you’ve always accepted cash in the past, there’s no reason not to use one of these simple, affordable mobile payment processors—and plenty of reasons that you should. If you’re concerned that the average 2.5% to 3.5% transaction fees will cut into your bottom line, here’s a secret: you’re losing far more money if you’re turning away hungry customers who only carry plastic. Even customers who usually bring cash might be eating at your truck less often than they would if you offered a credit or debit processing option. Mobile payment processors make it easy to swipe and pay, removing one more barrier to entry to eating at your truck. Suddenly, buying lunch from you is as simple as going to any other restaurant or fast-food chain—only much, much tastier. Have you ever used a mobile payment processor? Share your experiences with us on our Facebook page and see what other food truck owners have to say.